Imagine that our European NATO partners announced that they would soon fuse their national armies into a single force under the command of a European general staff. Imagine further that they agreed to set up staff headquarters in Germany and chose the new force’s commanding officer. Far-fetched? Not at all. It’s the logical next step in Europe’s accelerating drive toward unity. For the moment, countries have fused their economies and their currencies, not their military forces. But, where the mark, the franc, the lira, and the guilder are headed, armies, fleets, and air squadrons will eventually follow. And, when that happens, all the assumptions on which U.S. policy toward Europe has rested for the past 25 years—American dominance of NATO, a de facto U.S. nuclear monopoly in the alliance, European acquiescence to Washington’s political leadership, the absence of a strong European voice on critical global issues—may fade into the historical limbo of the cold war. European union—not just a common market but a common currency, a common defense, and a common diplomacy—has been talked about for decades. In fact, the talk lasted so long that union came to resemble the kingdom of heaven: something to be devoutly desired but deferred into the indefinitely receding future. Many, myself included, doubted that European countries would ever scrap that essential attribute of sovereignty—their currencies—as the price of unity. But now they have chosen the first president of the European Central Bank (after some bickering over who would get the post) with its headquarters in Germany, the economic powerhouse of the European Union. 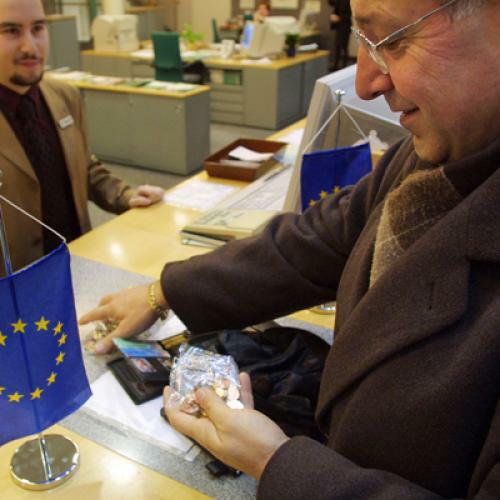 The currency that it oversees, the euro, will be born in scarcely seven months. For public consumption, Washington is upbeat about the prospect. “An integrated Europe is America’s natural best partner for the twenty-first century,” President Clinton has said. “If [European monetary union] is good for Europe, it will be good for us,” chimes in Lawrence Summers, number two at the Treasury Department. But these feel-good phrases conceal fears that a Europe moving toward real economic integration may be a less reliable and less predictable partner for the United States or perhaps not even a partner at all. Leave it to Newt Gingrich to dispense with niceties by suggesting that Britain drop out of the European Union and join NAFTA. Newt’s onto something. Farsighted American officials harbored doubts about European union long ago—even before the 1960s when General de Gaulle began complaining about United States “hegemony.” Henry Kissinger wrote 20 years ago that “divergences on monetary and trade policy were already increasingly apparent” and that “a politically united Europe was more likely to articulate its own conceptions in other areas as well.” What was possible then seems increasingly likely now—particularly because fear of Moscow no longer keeps Europe clinging to the U.S. for protection. On the economic front alone, a unified European economic policy, backed by a powerful euro, poses potential problems. First, as Gerard Baker notes in the Financial Times, it challenges the dominance of the dollar as the global currency—a dominance that allows the U.S. to finance its external deficit ($160 billion this year) from its own currency. If the U.S. had to pay off its debt in euros, it would face higher borrowing costs and diminished freedom of action. Washington foreign policy types, now basking in a self-congratulatory triumphalism, tend to denigrate a “eurosclerosis” marked by tow economic growth, high unemployment and social benefits, and “inflexible” labor markets. But this is changing. Across the European Union, growth is rising to a projected three percent average this year, unemployment is beginning to fall, privatization is spreading, and both inflation and deficits are under control. This year every EU member except Greece met the criteria for monetary union: limiting the budget deficit to three percent of GDE Inflation is at the same level as in the U.S.
To be sure, there are plenty of economic barriers to turning the EU into a powerhouse. Growth could stall, unemployment could shoot up as competition stiffens, and deficits could jump. Germany could throw its economic weight around and try to dominate the EU politically. France and Britain could balk or choose sides. Petty bickering and fears over diminished status could torpedo the whole enterprise. But these perils were inherent from the beginning (as they were among the fledgling states of the American union), and they have been surmounted. What is striking is that the will for unity has steadily increased. Now, it is fortified by the absence of a serious external threat and by modernizations of the European economy that set the stage for years of growth. The eleven EU states that have embraced the common currency (four are on the sidelines) have a combined population greater than that of the U.S., an equal share (19 percent) of world GDP, and a bigger cut (18.6 percent) of world trade. If Europe succeeds, what will it be? For the first time, American policymakers have to ask that question seriously. During the long cold war, they could piously affirm their dedication to European unification, while knowing that, so long as the Russians growled and the Germans were divided, nothing serious would come of it. Now, that has all changed. An economically unified Europe will have not only its central bank in Frankfurt but its nerve center in Berlin. It will be a Europe of many parts, some of them fiercely nationalistic and sensitive, but with one dominant leader. Germany is no longer a Western outpost in the East but the very center of a uniting Europe. And its loyalties, like its interests, will be increasingly more European than Atlantic. Such a Europe will almost inevitably develop independent military structures, pursue separate policies toward Russia, China, and the Middle East, and challenge the premise of American leadership that NATO has operated under for the past 50 years. Indeed, it will make it harder to use NATO as an instrument to keep Europe under American direction. Moving NATO east by pulling in new members—a policy vigorously pursued by the Clinton administration—will only stimulate the creation of a larger, stronger Europe. Of course, the Europeans embraced NATO expansion. It offers a cost-free insurance policy while the house is being built. For decades, Americans in high places breezily proclaimed their support for a self-reliant “European pillar” of NATO, while blithely assuming it could never be built. They should have been more careful what they wished for. This article appeared in the June 1, 1998, issue of the magazine.